Last week, I spoke at the Catalyst Conference in Irvine, California on the topic of my new book, Platform: Get Noticed in a Noisy World (Thomas Nelson, May 22). 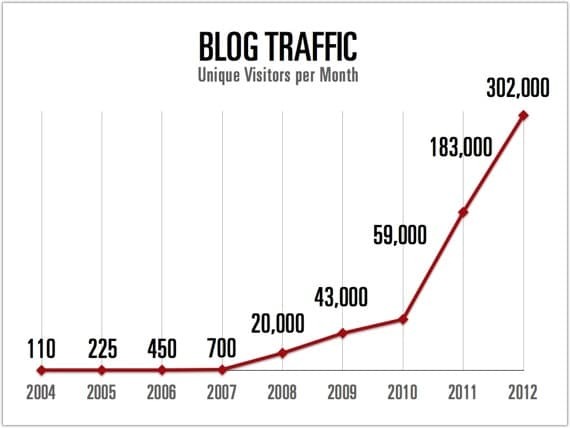 As part of my introduction, I shared how my audience has grown since I started blogging in April of 2004. Note that these numbers reflect my average monthly unique visitors. I simply took the total number of unique visitors for the year and divided by twelve months (or in the case of 2004, eight months). With the exception of the first few years, this data came from my Google Analytics account. It took me four years to attract more than 1,000 readers a month. In fact, I blogged for almost three years before I had more than five hundred readers a month. If you are not seeing much growth in traffic, don’t get discouraged. Focus on generating consistent, quality content. I started blogging more consistently (three days a week). I focused more on my reader’s needs rather than my experiences. A few big web sites linked to me, including Lifehacker. This gave me exposure to a whole new audience. I found my blogging voice. So many people quit right before they hit the inflection point. I hope you won’t. Getting your message out depends on you sticking with it. I built a platform long before I needed it. As my audience grew, I was able to use it on behalf of my company to correct the media when they got the story wrong. I was even able to report on stories I felt the media had ignored. I also used it to promote my own products and, eventually, to generate enough income I was able quit my day job to write and speak full-time. Question: When is the best time to build a platform? Question: When is the second best time? It wouldn’t have taken me so long if I knew then what I know now. I made a lot of mistakes. I didn’t understand much about generating traffic. Social media didn’t even exist at the time. This is one of the main reasons I wrote my new book. I wanted to distill everything I have learned, so I could share it with people who need a platform but don’t have eight years to build it. Whether you are an author, recording artist, comedian, small business owner, or corporate marketing director, this book is for you. Again, I am sharing this detail about my traffic to encourage you. Everything significant starts small. I didn’t achieve success overnight and you probably won’t either. But the great news is that it is possible. In fact, it’s never been easier—especially if you get started now and learn from the mistakes of others. Question: Where are you in the process of building you own platform? You can leave a comment by clicking here.